View our rubber flooring options here. Not everyone is lucky enough to have a fish room but those that do enjoy the benefits they provide. There is plenty of space for sumps, refugiums, skimmers, filters, sterilizers and so on. It also gives many fish tank owners a place to hide from the burdens of life. Ask an owner of a fish room and you’ll find that there are many do-it-yourself projects in such an endeavor. Interestingly, one of the areas that is paid the least attention to is the floor. Why is that? Many fish rooms are located in the basement which usually means that many owners have bare concrete floors. These floors offer the benefit of being extremely supportive to the weight that many of the components a fish room may have. However, concrete is quite cold and uncomfortable to spend a lot of time on. In addition, concrete is porous which over time can absorb water and salts from spills. Lastly, many chemicals are used in fish rooms and these spills are difficult to clean from concrete. Carpeting is the worst choice to make in a fish room. Spills of any kind are difficult to clean and it is best not to use carpet if given the choice. However, there are good qualities about carpeting that make it appealing. First, it is warmer and more comfortable than the other options available. It addition, it does have sound deadening qualities that will help keep the noise from all the pumps and water splashing to a minimum. Wood is another possible choice, although not very common. Wood is cold and has very little sound deadening properties. In addition, without regular maintenance wood’s finish can break down and can absorb spills. Linoleum is a fairly good choice for many fish room owners. It is warmer than wood or bare concrete and spills are easy to clean up. It is also quite durable. If you are just building your fish room, linoleum may be a good choice. It does take some effort to install and requires the use of adhesives to install it properly. Spills should be cleaned up promptly because if left they can reduce the bond between the linoleum and the sub-floor below it causing peeling and warping. Tile is another choice, but it is generally not a very good choice. Grout can break down over time and the weight of fish tanks and other fish room items can actually crack the tile. In addition it is still cold and offer little to no sound deadening qualities. Rolled flooring (sometimes called rubber flooring) is probably the best choice for just about any fish room. Actually made of high quality polyvinyl, rubber flooring was originally designed to be used in the garage and it’s durability is one of its best selling points. Rubber flooring is warmer and more comfortable than wood, tile and concrete. It’s anti-fatigue properties also make it a pleasure to work on. Spills are easily cleaned and it does not absorb water, salts or chemicals. Rubber flooring is quite inexpensive and offers very good sound deadening properties. Because rubber flooring is not glued down it can also be easily removed from the fish room and brought outside for a good cleaning and rinsing with a garden hose. One of the best benefits of rubber flooring is that installation is a breeze. 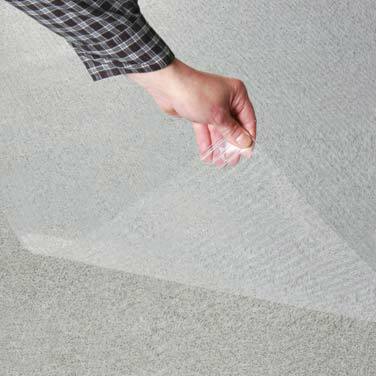 Because it uses no adhesives, you simply roll is out, trim as needed and lay it down. If you already have another type of flooring (like wood) and you prefer its appearance, a clear rubber flooring would be a good choice. You enjoy the benefits of the look of wood with the qualities of rubber flooring. What if your fish room is already stocked? Again, not a big deal with rubber flooring. 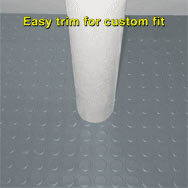 Because it is easy to install you can trim around obstacles for a nice clean look. In addition, you don’t have to worry about the dangers chemically installed flooring can present to your precious aquatic life. If your lucky enough to have that fish room take it to the next level with a new floor. Not only will it look better but it will be safer and clean up easier than any other floor available. This entry was posted in Updates and General Garage Flooring News and tagged clear rubber flooring, fish room flooring, rubber flooring on June 19, 2008 by Store It Well Staff.